How Lazy Do You Have to be to use One of These? As a man, I love my power tools but as a gentleman Monsieur, I love that there are certain gentlemanly arts that every man should know. 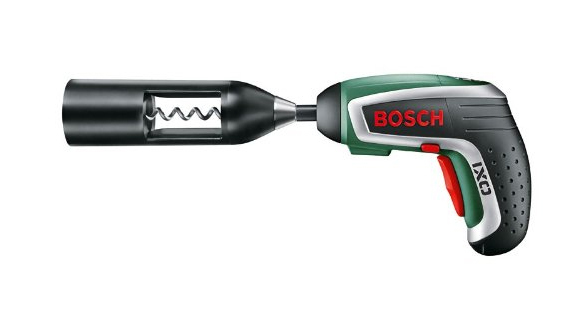 While I enjoy the cool Batman-esque power tool that is the Bosch IXO Vino Cordless Screwdriver with Corkscrew Attachment, I cannot abide the fact that using one of these to open a wine bottle is overkill and not to mention lady friend libido stopping. That said, the Bosch IXO Cordless Screwdriver is handy around the house for quick fixes, finishing your DIY projects with maximum efficiency so you can get back to enjoying the finer things in life. 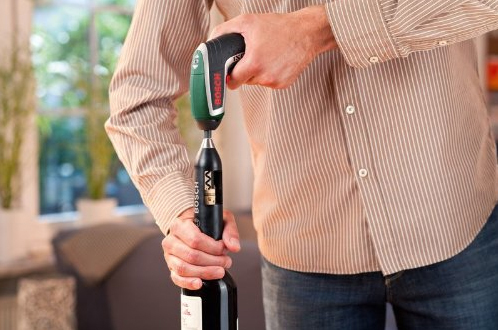 The Bosch IXO Vino Cordless Screwdriver with Corkscrew Attachment is available on Amazon. Cut the foil from the bottle’s neck by running a blade around the lip of the wine cap at the top of the bottle. Expose the cork by removing the foil. Get a firm grip on the neck of the bottle and place the corkscrew dead centre of the cork. Turn lightly at first, ensuring the screw tip of the corkscrew enters straight. This will minimise chances of the cork disintegrating when you try to pull it out later. Continue with you tight grip on the bottleneck and twist till corkscrew is completely in. Depending on what type of corkscrew you’re using, you either lift two levers, one on either side of the corkscrew to the 12 o’clock position OR flip down a lever and pull on screw embedded cork on the opposite arm, using the leverage to pull out the cork. If it’s the old school “T-bar” kind of corkscrew, muscle down and pull, rocking it back and forth till the cork is released from the bottle. Unscrew the cork from the corkscrew and sniff it like some wine snob (please don’t).